Håvard Gimse is now firmly established as one of Norway’s leading musicians with a bold and expansive repertoire, including an impressive list of 30 performed piano concertos, he is heavily in demand as both soloist and chamber musician and his vast experience means he is also the accompanist of choice to many of Scandinavia’s finest artists. Håvard’s great affinity with Scandinavian, and particularly Norwegian music, means he has become one of the arenas most influential and significant recording artists. His sympathetic approach and intelligent partnering of lesser known Scandinavian and Norwegian works, arrangements and composers always receive unanimously superb reviews and prizes including Diapson d’Or and Gramophone’s Critics Choice, encouraging and creating new and enthusiastic audiences. His most recent recordings include discs of Schubert and Schumann with Henning Kraggerud for NAIM, which was nominated for the Spellemanpris (the Norwegian Grammy) in 2011 and his recording of Grieg pieces with Truls Mørk. Recent solo discs include repertoire by Chopin and Grieg for NAIM, Sibelius, Grieg and Tveitt for Naxos and Grieg Violin Sonatas for Sony, and his concerto discs include all five of the 5 Tveitt Piano Concertos for Naxos, Grieg with the Royal Scottish National Orchestra and he will record Poulenc’s Double Concerto with Christian Ihle Hadland with the Norwegian Radio Orchestra in January 2011. In December 2012 he released “Arvesylv” on Fabra Records, containing works by Tveitt, Sæverud and Mørk Karlsen. As a concerto artist, Håvard Gimse has performed extensively throughout Scandinavia, with recent and future invitations from the Stockholm Philharmonic Orchestra, the Oslo Philharmonic Orchestra, the Bergen Philharmonic Orchestra, Finnish Radio and Danish Radio Symphony Orchestra and Norrkoping Symphony. Further afield he has performed with the Baltimore and Birmingham Symphony Orchestras, the Royal Philharmonic Orchestra and the Royal Liverpool Philharmonic Orchestras, Japan Philharmonic Orchestra, Prague Symphony, Frankfurt Radio the Konzerthausorchester Berlin and Belgian National Philharmonic Orchestras. 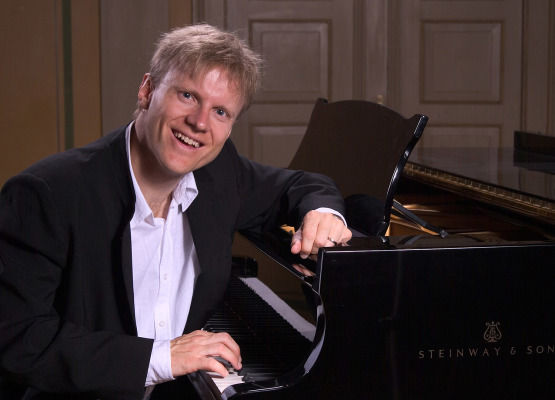 In 2013 Håvard will, among other things, be the solo pianist of the ballet performance “Spring Fever” at the Norwegian Opera and Ballet, and he will also perform with orchestras in Bonn, Kristiansand, Oslo and Trondheim, as well as attending chamber music festivals in Bergen, Trondheim and Oslo.